Of course, for those leasing land to wind companies, the prospect of $10,000 or more per year for each turbine is very attractive. “There’s no legal crop we can grow to make that much money off of one acre,” said Sara Bovill, president of the Lincoln County Farm Bureau and co-chairwoman of Farmers and Friends for Wind, which encouraged Lincoln County voters to reject the proposed half-mile setback. David Iverson, a landowner at the Buffalo Ridge II Wind farm affirmed, “I’ve lived here all of my life and I’ve been farming since I was in my twenties. I think it’s a great opportunity for landowners to expand their income; the farming community is strictly based on crops and livestock and that income fluctuates, the wind towers can be a steady source of income.” That’s why the South Dakota Corn Growers Association, South Dakota Farmers Union, South Dakota Farm Bureau, and others joined together to urge voters to reject the Lincoln County regulations; Farmers and Friends for Wind did not merely reject the half-mile plan but also made a weirdly extreme callout in favor of “most common setback limit in the U.S.” which they claimed was 508 feet. This was, in fact, the default state standard (1.1x turbine height), but is far from common. The previous Lincoln County setback was 3x turbine height, effectively about 1500 feet, which is indeed quite common nationwide. As the Lincoln County began grappling with the issue in 2014, Dean James, another local, stressed that “We would like to preserve this for our kids and our grandkids so they can come out and not look at wind mills, and so we can still farm this land.” Over the past three years, county officials have considered several revisions; in late 2016 they briefly endorsed a one-mile setback. In May of this year, the County Commission voted 4-0 in favor of the half-mile standard, the least extreme of those on the table at that time. Dakota Power Community Wind immediately set to work gathering signatures to call for a town-wide vote on the new ordinance. Earlier this month, voters affirmed the half-mile setback, in a 57%-43% vote. Crucially, the ordinance provides for closer siting to any neighbor who agrees; these exemptions are included in nearly all wind ordinances (especially those that adopt larger, more precautionary setbacks), though they are generally ignored in claims by wind advocates that such ordinances are a death knell for wind farms. Meanwhile, in 2016 a 9 to 11 turbine wind farm was rejected by the Davison County Commission in a 4-1 vote. That project was on a three- by one-mile piece of land owned by one landowner, and neighbors had expressed concern. “Once this precedent is set, we could have these all over the county,” said commissioner Denny Kiner. “I think it would be presumptuous for us as a county commission to rule on something that is a new industry,” said his fellow commissioner John Claggett, who is in favor of bringing wind farms to the county. In the wake of that decision, county has continued to move cautiously. In May of this year, the Planning Commission tabled plans for a 1000-foot setback and in July it passed a new comprehensive zoning ordinance in which the wind turbine sections were deleted in the final round of planning. “We may be on wind energy for six months,” said Planning Commission Chair Bruce Haines. Allowing the public a say on the matter during the next major election cycle would help the county determine whether the opposition to wind energy is a case of a noisy minority or if the few represent the many. It would also take the impossible task the Planning Commission has been given to make all parties happy out of its hands and place that task into the hands of the voters. 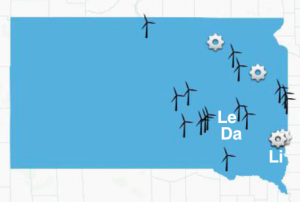 After years of debate, Lincoln County can finally end all wind energy talk. Now, more than one year after Davison County barred a 9- to 11-turbine project from entering county limits, Davison County is still talking about wind tower setbacks. Wouldn’t it be nice to simply let the people of Davison decide what they want and then move on? We think so, and we suspect Lincoln County residents are glad to put the vote behind them. UPDATE: Another SD county, Hughes County, has just adopted a modest increase in their setback requirement, from 1000 feet to 1400 feet.